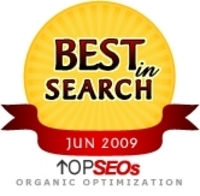 June 11, 2009 -- The ranking of the best search engine marketing companies by topseos.in for the month of June has come out with major surprise at the top. PageTraffic, previously ranked at No.2, become the No.1 SEO Company in India. Comprehensive improvement across the scoring parameters has given PageTraffic the well-deserved ascendancy. The No.2 position made us hungrier for the logical next step. We have been continuously innovating across the segments to provide better results and services. But the last couple of months made our teams incredibly aggressive. We have rolled out new SEO report cards, better traffic and goal conversion analysis, brought down the response time among quite a few other improvements. Navneet Kaushal, CEO, PageTraffic, says "The No.2 position made us hungrier for the logical next step. We have been continuously innovating across the segments to provide better results and services. But the last couple of months made our teams incredibly aggressive. We have rolled out new SEO report cards, better traffic and goal conversion analysis, brought down the response time among quite a few other improvements." He also mentions company's technical expertise, ethical practice and commitment to clients' goals for its continuing success. topseos.in is known as one of the most rigorous ranking systems in the world. PageTraffic is already positioned at No.27 in its global rankings of SEO companies and No.1 among Indian link building companies. Founded in 2002 and over 650 successful campaigns old, the company's zeal for success is the reason behind them being at the top. This is the latest addition to numerous awards and accreditations that the company has won over the years. Get Data, Airways Hotel, Custom Embossers, Stellar are few of the company's long standing SEO clients who have benefitted from its constant processes of upgradation and SEO expertise. In addition to the goal oriented strategy setting, 24/7 customer support, the most advanced project management system and absolute accountability eases the process for clients. Mr. Kaushal is eloquent about his company's plans for the future. "Most companies will make the mistake of taking a pause after reaching the top. We always knew we will have to work harder to retain this position after getting here. So, we are looking forward to fine tuning our processes, listening to our clients' feedback and making changes where it's required. Our clients expect more from us now and there is no way we will disappoint them." PageTraffic at the forefront of the industry. The company is buzzing with activity and excitement. More surprises are expected soon.